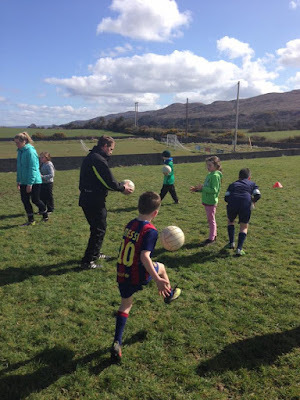 Welcome to the Official St.John's GAA Club Sligo website. SENIOR'S BACK TO WINNING WAYS! Our Seniors returned to winning ways Saturday evening with a decisive 1-20 to 1-06 victory over Enniscrone in Cuilbeg. 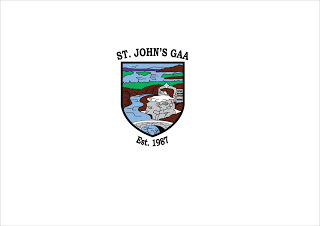 Following defeat to rivals Drumcliffe last week it was imperative for St.Johns to get off to a fast start back on home soil and with the wind at their backs, the forwards duly obliged. The full forward line in particular, with Shane Stenson added for a more varied attacking strategy, stepped up to the mark, kicking 1-08 between them in a game which saw 10 different names on the St.Johns score-sheet. An initial onslaught, which saw the home side knock over 5 points without reply in the opening 10 minutes nullified any kind of Enniscrone game plan and left them chasing scores from very early on in the contest. This allowed a tenacious and hardworking defense led by full back Feidhlim Murphy to effectively handle much of what the West Sligo side had to offer in attack. A well worked goal for Ian Rossiter midway through the half put St.Johns firmly in control and despite a brief lapse in concentration in the final 5 minutes, they led comfortably 1-10 to 1-02 at the half. The second half saw a different kind of performance from St.Johns but one that will be equally as pleasing for management as they continued to dominate against the breeze. Another fast opening salvo of points put them game to bed and it turned into a case of game management thereafter, with the team showing great poise and character to kill the game off with a minimal of fuss. The continued ability to generate scores against the wind and the way in which the team dealt with the different strategy from the visitors will be particularly pleasing. Attention now turns to a difficult assignment away to Geevagh next Saturday evening in a tie that could have a big say on who secures promotion at the end of the league campaign. St.Johns: Noel Hynes, Enda Roche, Feidhlim Murphy, Paul McLean, Eoin Flanagan, Niall Walsh, Robbie Galvin (0-1), Barry Dwyer, David Rooney (0-3), Cathal Jordan, Brian McGowan (0-2) Fiachra Grennan (0-3), Alan Keane (0-3), Shane Stenson (0-3), Ian Rossiter (1-2). SUBS USED: Robbie Fahy (0-1) , David Burke (0-1) , Daniel Smith (0-1) , Chris Murphy. UNDER 9s CONTEST LOCAL DERBY!! The conditions were perfect for the local derby between St John's and St Mary's. It was a physical encounter between the two with both sides fielding 11 players. The first quarter saw the return of Mimi Lee in goals who provided strong kick outs to set up attacks for the forwards Adam Feeney, Donal Flynn, Ryan Gaffney, Rachel McGoldrick and Thibaud Gerard, which resulted in Adam scoring 1 point from play. The second quarter saw Donal Flynn don the goalkeeper jersey and was well supported in defence by Jack Davey, James Dylan Barnicle, James Malone, Ross Hargadon and Roan Tully. Mimi Lee joined the forwards scoring a well taken free. The third quarter had James Dylan Barnicle in goals which saw him make 2 close range saves. The versatile Jack Davey moved into the forwards with Mimi Lee, Donal Flynn, Ryan Gaffney and James Malone to score a long range point. With confidence building St John's got into the rhythm of the match. The final quarter saw St John's come into their own dominating possession. James Malone put in heroic saves and stayed calm under pressure. Mimi Lee covered a lot of ground, not allowing her opponent to score. Tenacious tackling and close marking from Thibaud Gerard, Ross Hargadon, Ryan Gaffney and Roan Tully resulted in more attacking opportunities for St John's. These opportunities were capitalised on by Adam Feeney, Donal Flynn and Jack Davey resulting in more chances to score. The persistent Rachel McGoldrick scored 2 points and adding to this tally was James Dylan Barnicle who scored 2 points, 1 from a free and 1 from play. Although not overall winners on the night, the team showed in the final 2 quarters that they can hold their own against a strong opponent and the kids are already focusing on their trip to Tubber!! Under 12 Girls Team Returns For 1st Time in a decade! 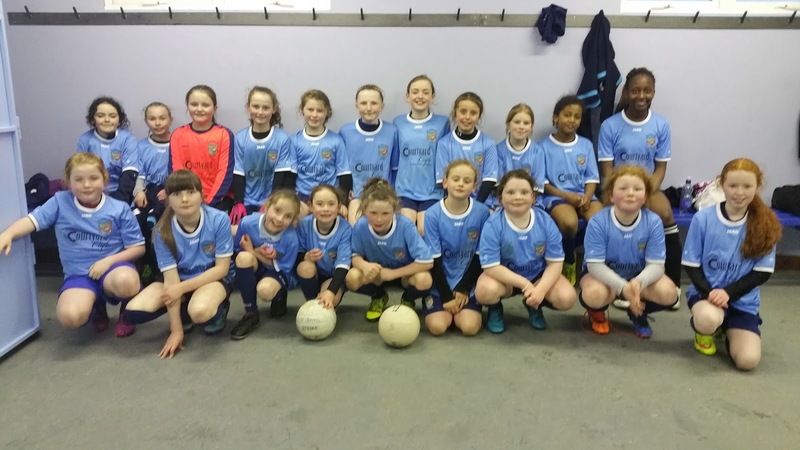 In muddy conditions the girls U12 played their first match in 10 years with beautiful new jerseys , sponsored by Courtyard Cafe on Teeling Street. St John's started the match with no 12 year olds , only a single 11 year old along with 6 girls who have yet to make their First Holy Communion. What all these players lacked in height and years they made up for in tenacity , courage and spirit. 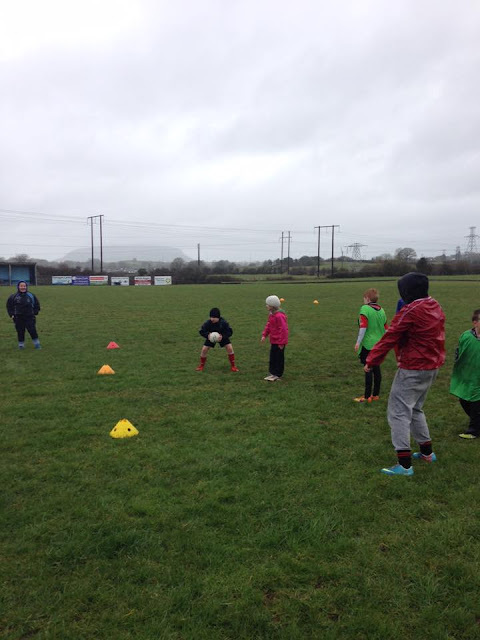 Heather and Grace were brave in defense ably assisted by Faith, Aibhe and Emily. Ava was strong with her kick outs and saved plenty. Faílenn was an asset when she arrived and spread the ball well. Rachel was tenacious and skillful and partnered brilliantly with Naomi who came on in the 2nd half. Between them they scored 6 times, a pointed free by Rachel and a goal and 4 points from play by Naomi. Claudia and Louise were very strong, Mimi covered great ground , Shannon , Jersey & Julie marked and passed very well . The girls who were not mentioned yet were reserved til the end on purpose. They are the 2nd class crew who are 8 years of age. They deserve the biggest praise. Tonight they did their families proud , catching , kicking , passing and blocking opposition 4 years older and 2 feet taller ! Aibhe McC ,Annabelle, Ceoladh , Ciara, Emma , Rachel (already mentioned !) They subbed on and off every 4 minutes , without complaining , recharging their batteries to unleash more skill . Huge thanks to all the supporters who came to our first match , to Rachel and Danielle - our mentors , to Gerard for starting up this team for the girls of the community and coaching them every week . Here's to many more matches with as much fun . Mol an óige agus tiocfaidh sé! 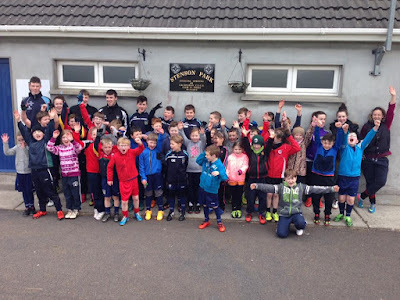 St. John's Academy undertook to run a four day Easter Camp over the Easter holidays which turned out to be a huge success despite some very mixed weather. 35-40 children were present each day ranging in ages 5-14. 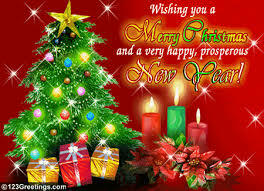 The atmosphere throughout the week was one of excitement and unbound enthusiasm. The kids had great fun and will no doubt be back for more in the future. Many thanks must go to those hard working people behind the scenes that make such weeks possible, and also to our dedicated young coaches who put such effort into the week to make it as enjoyable as possible for all the young children involved. The club will be safe in their hands in the future. A special thanks also must go to the Sligo Gaa coaches (Liam Óg, Benny and Ross) for their contribution. There was also a talk about nutrition for the children by Gabriel McSharry which concentrated on teaching them the difference between good sugars and bad. An information leaflet was sent home which each child. It is important that we all do our bit to keep our kids healthy. 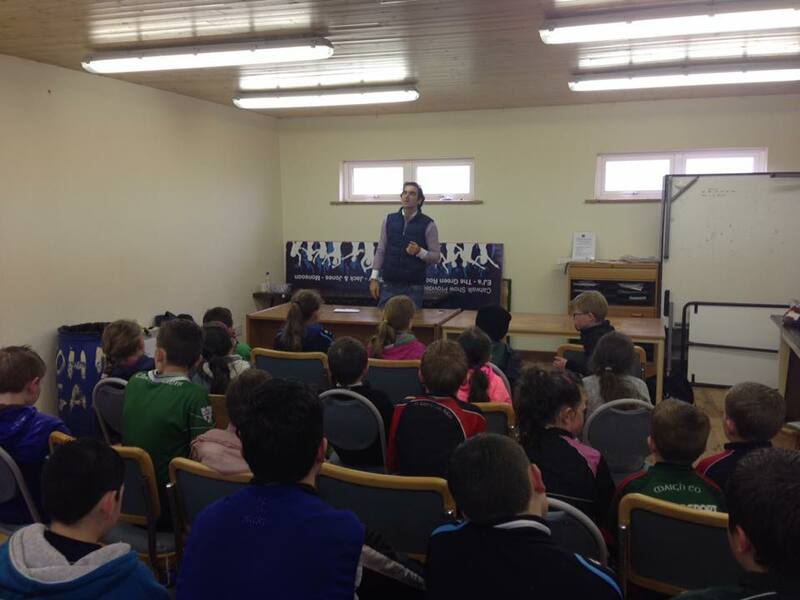 Our next big camp will be the Kelloggs Cúl Camp in July. We would like to encourage all our parents and coaches to promote what will be a great week for the young players in the St. John's Academy. Finally there are a few photos attached that is just a snippet of what was a great week. I would encourage everyone to friend our Facebook page and follow us on Twitter for more photo's and news. 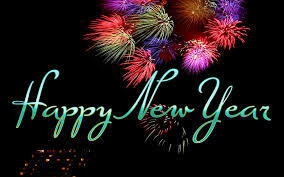 Happy New Year to all in St. John's G.A.A. Club at home and abroad. Le gach Dea-Ghui i gcomhair na Nollag is na hath bhliana. St. John's G.A.A. Club Carraroe Sligo. Copyright © Michael McGee . Powered by Blogger.